The Stage 2 civil design of the Mullum Creek development is more or less complete having now gone through a number of Council checks. The design of the Stage 2 wetland is being enhanced to match Melbourne Water’s new Best Practice guidelines. While this has added new layers of complexity, this will ensure the highest quality of stormwater treatment, in line with the environmental focus of the Mullum Creek development. The current state of design for Stage 2 means that we anticipate Stage 2 construction will commence at the start of the New Year. If all goes to plan with construction, titles and settlements should occur in August/September 2017. With setttlement now finalised, it is fantastic that Stage One owners can move ahead quickly in the design process. We’re looking forward to some great new designs. For each lot at Mullum Creek, the DRC budget allows for one review of a design application at each of three steps in the design review process. This process includes a step-by-step review of a proposed design against the Mullum Creek Design Guidelines, and the preparation of detailed reports offering recommendations for improving the environmental performance of your design. One energy rating of your home is also prepared or confirmed at each review step, and paid for by Mullum Creek Pty Ltd. However lot owners and designers need to remember that the DRC budget does not support additional design reviews or energy rating work necessitated by re-submission where designs have failed to meet the Guidelines after the first review and feedback. This also applies where there significant alterations are made to an approved design which lead in effect to beginning the reviews anew. We are continuing to keep the gates on Illawong Drive locked. This is to deter illegal dumping and prevent damage to the roads, curbing and lots and infrastructure that might arise while there is no ongoing presence on the site. It also reduces risk while Yarra Valley Water continue their works on installing the main sewer upstream of our development, and before the landscaping works commence to secure the wetland area. Of course you and your people are free to access your lot at any time. There is a combination lock on the gate at Illawong Drive: to open, set the numbers to ‘2, 4, 6, 8’ and press the shackle downwards into the body of the lock; the lock should then spring open. Please leave the gate in the condition you found it (either open or closed). We hope to have a lock with the same combination on the Berrima Road entrance soon. If there is something wrong with the gate or lock please let us know. Generally, the site can be accessed on foot by walking around the temporary fencing. A community organised farmers market run by the Park Orchards Ratepayers Association and Park Orchards Lions Club selling fresh meat, fish, poultry, dairy, fruit, nuts, berries, vegetables, herbs, breads, wines, oils and condiments. Visit the Observatory Precinct at Melbourne Gardens for a weekend of indulging your passion for plants at the new spring gardening event. Celebrate plants and gardening with plant sales, pop-up talks and tours and an extensive panel discussion program. Stalls – Purchase rare bulbs, seeds, plants, books and artisan gardenware. Experts – Access to specialist knowledge and tips direct from growers. Panel discussions – Join in lively debates with industry leaders. Pop-up talks – Hear about hot topics and emerging trends from industry professionals. Behind-the-scenes-tours – Discover the inner workings of the Herbarium and Nursery. Plant crèche – Shop all day, use the plant crèche: gold coin donation. There are places you remember. 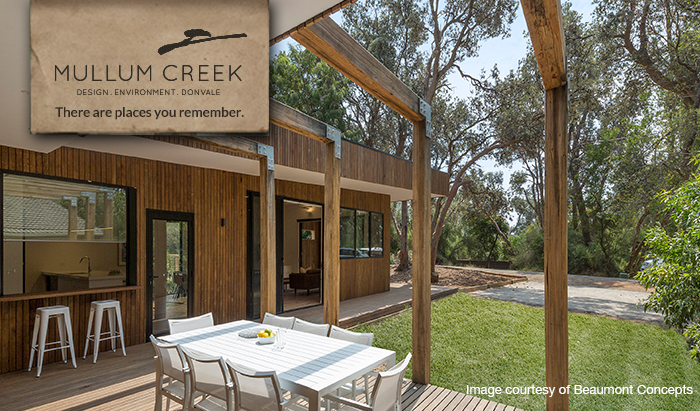 Mullum Creek is a place you’ll never forget.